Each piece of estate jewelry has its own history. The diamond necklace you may see today has 100 years of its own story. Who did it belong to? What parties was it the star attraction of? What was the happy occasion that was being commemorated and most importantly what celebrations will it commemorate in the future? A piece of fine jewelry being presented as a gift starts and takes on its own happy journey. Each time you look at your engagement ring, you remember the words used when it was presented to you. Nothing has that same expressive appeal as jewelry, and nothing else you wear on a daily basis can embody your personal journey. We are on a constant search looking for new and interesting pieces to add to our ever-changing collection, and we purchase or consign items so you can start your own personal happy journey. 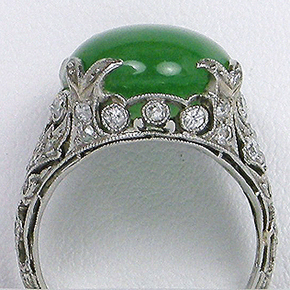 Estate jewelry is defined as jewelry that has been previously owned. It may be two months or two hundred years old. The valuation of estate jewelry can be extremely complicated compared to that of modern pieces due to such factors as age, condition, materials, designers, hallmarks, signatures, and provenance - the value of an item increases substantially if it is signed, or has provenance. Other items that affect the value of a piece of jewelry are whether it is in original condition, or whether a piece is accompanied by its original box and bill of sale. By the reign of Queen Victoria, the Industrial Revolution had created a growing merchant class eager to flaunt its newfound wealth. England and France became major jewelry centers, taking advantage of the new technology to mine precious metals and mass-produce precious gemstone jewelry. The mid and late Victorian Period was influenced by the romantic image of Queen Victoria and Prince Albert. The pieces of this time were feminine seed pearls, shell cameos, strands of pearls, and small colored gemstones. After Prince Albert's death in 1861, jewelry styles changed almost overnight as Queen Victoria adopted somber jewelry expressing her grief. Jet, black onyx, tortoise shell, and horse hair, often set into heavy gold-work frames, and other pieces displaying a somber tone. By the end of the 19th Century, Victorian popularity was fading. The Art Nouveau period - romantic and lighthearted - burst upon Europe and America as a reaction to both the staid Victorian era and the mass-produced, imitative pieces resulting from the Industrial Revolution. This reaction was apparent in all the decorative arts of the period. 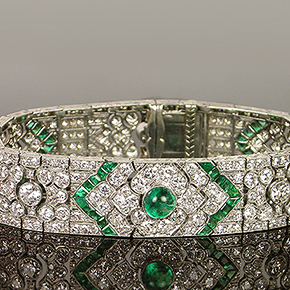 The genius of the French master jeweler Rene Lalique helped to define this period. Although Lalique gained notoriety for his glass works, his slim, ethereal jewelry figures were of brilliant enamels with precious gems, horn, ivory, and glass. Dragonflies, with long delicate enameled wings, and stylized floral themes, utilizing opals and moonstones, were popular. Another important figure who strongly influenced the Art Nouveau period was the American jeweler Louis Comfort Tiffany, son of Tiffany's founder Charles Tiffany. Queen Victoria was succeeded by her son, Edward VII. The Edwardian Period celebrated the joyous return to elegance that marked the reign of the new King. Jewelry complemented the lace, silk, and feathers worn by Edwardian ladies. Diamonds were in abundance, alone or with colored gems, and pearls. The use of platinum facilitated delicate filigree work fashioned to resemble fine lace. The Art Deco period originated in France at a time when women - who had been doing men's jobs while the men went off to war - began to express their new-found freedom. They smoked and drank in public, shortened their skirts, and welcomed the flamboyant, geometric styles of Art Deco. This was a brasher, more sophisticated time. 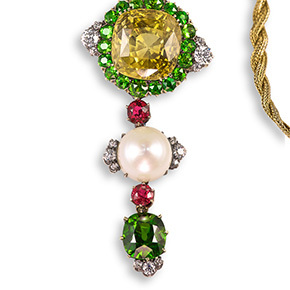 The jewelry of this period, bold geometric pieces in enamel and colored gems, enhanced the angular look in clothing. 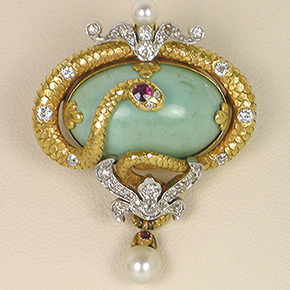 Massive ruby and emerald brooches were typical, as were coral and lapis lazuli or jade used in combination. Platinum settings of exquisite workmanship are a hallmark of Deco. With the beginning of war in Europe, luxury production halted as platinum, and most gold and silver, were requisitioned for the war effort. It was during this period that American jewelry came into its own. The glamour of Hollywood and its stars influenced the flamboyant pieces of Retro. Huge gems in oversized pieces, often mounted in rose, green, or yellow gold alloys, were typical. America's entry into the war signaled a time when the jewelry produced became less romantic and bolder. It was during the Retro period that gold began to be used as the sole element. Gold had previously been used in mountings to accent other elements of a jewelry piece. Now gold jewelry came into its own. Many of the gold brooches seen today, such as circle pins and animal pins, owe their origins to the trends of the late 1940's and 1950's.